R+ training is the most modern humane training method. It focuses on rewarding when the dog demonstrates desirable behaviors. 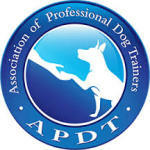 If your dog is taught a desirable behavior, and it is reinforced, it is likely for that behavior to occur more often. Rewards including food, toys, petting, verbal praise and other life rewards are used as reinforcers. Where will Nicole take my dog on walks and doggie adventures? How long has Nicole been a dog lover? What brought her to working with dogs? She has loved dogs her whole life. She grew up with a mixed breed rescue from a local pound. The dog was quite territorial, pretty reactive with other canines and guarded her food and toys, so Nicole quickly learned how to handle some tough behaviors. She also learned to respect her dog’s unique personality and background. A few years ago Nicole rescued two mixed breed puppies within a few months of each other that have become the love of her life. In fact, Nicole’s dedication to training these two love bugs led her to leave a career in education to become a certified dog trainer. She entered a Master’s Program at Catch Canine Academy based out of NJ and has been studying, reading, volunteering and working with canines non stop for the past three years. She is always thinking of new ways to engage with the pups, from creative interactive toys, to nose work and agility exploration. 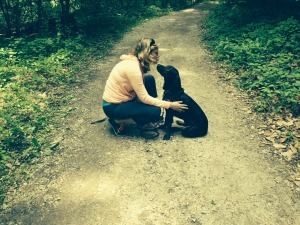 What does Nicole need to know about a dog before sitting or walking a dog? Does she have any breed preferences? She will always schedule meet n greet with you. She may come to your home or schedule a meeting with you and your dog on neutral grounds. It is also very important that other dogs get along well before welcoming the new dog to go on a pack walk or dog adventure. Vaccination records are a must. Nicole prefers dogs that are spayed/neutered. You must fill out a profile form and provide information about flea, tick and heart worm treatment. It is also important that you provide updated vet records. Does Nicole have reliable transportation in the event of an emergency? What is Nicole’s yard like? What will the dogs do during daycare? The fully fenced-in spacious backyard has large grassy areas on all sides of a huge pool. Yes, dogs are allowed to go swimming! There is also a large area with rocks on the side of the house where dogs love t go lizard hunting and sniffing. The backyard is surrounded by palms and other trees, providing shade and entertainment and a deck that many dogs love to sun on. There is plenty of balls and toys, agility equipment, water bowls, and even a baby pool out back. The yard is professionally treated for fleas and ticks monthly. All outside play is fully supervised. Games of fetch, tug, hide-n-seek, find it, and chase are commonly seen. Oh, and don’t be surprised if your dog comes home knowing a new trick and showing off some obedience skills. Why should you book a walk or daycare service with Nicole? With Nicole you get much more than what you pay for. Nicole is a dog expert, plus she plays with the dogs, brings them exciting places, and trains them whenever they are with her. You don’t get that kind of individualized attention when you bring your dog to a daycare facility. Plus, your pup gets to play in a house and yard with just a few doggie pals under full supervision. Nicole and Luna share all their toys, beds, and treats! Walks, runs, and/or jogs with Nicole are safe and structured. She will use a harness on walks that best fit the dog’s body shape. She is selective about the neighborhoods explored, amazing with her handling skills, and teaches the dogs walking etiquette too. Nicole is always working on teaching the dogs a new trick or basic commands during private training sessions and on walks. Nicole always updates you with pictures and videos of the fun your dog is having and will text you detailed information about the walks, training sessions, and send you a GPS tracking of their activity. Nicole carefully selects dogs into her pack after a detailed consultation and/or meet n greet, so you know that your dog will be with other well behaved, social dogs. Be sure to read testimonials from clients!